Frosted glass of a margarita/file photo. When you are born on Feb. 29, you are a "leapling," and you only get to celebrate your birthday every four years. So when your day does finally roll around, you probably want to celebrate. A lot. This year, many companies are going out of their way to help with the celebration. And, in some cases, you don't even have to be a leapling to get a treat. But first, why do we have leap year? Mostly to stay in line with the Earth's movement around the sun, according to history.com, and that requires the addition of 24 hours to the Julian Calendar every four years. But don't worry about history. Go ahead and enjoy a dessert and a margarita. Here are some of the deals to look for on Monday. Great American Cookies giving one free Individually Yours Cookie Cake to people with a Feb. 29 birthday. Hat retailer Lids will give free shipping on orders of $50 or more on Feb. 29. Legal Sea Foods is slated to sell two one-pound lobsters with two sides for $29. 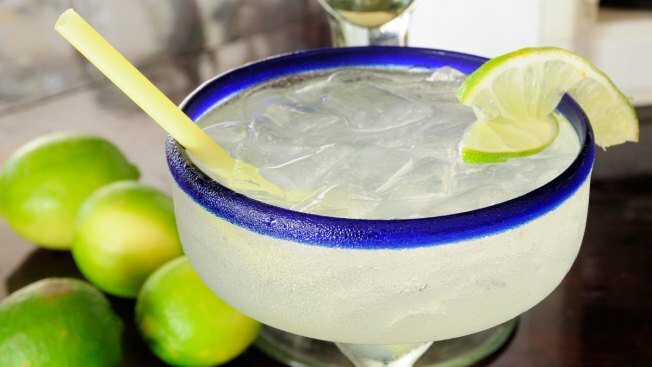 Margarita's Mexican Restaurant is offering fried ice cream and a Leap Year Margarita for $2.29. Hard Rock Cafe has a "Leaplings Eat Free" menu with six entree choices. McAlister's Deli will give you a free freshly baked cookie. Olive Garden is doing a free dessert giveaway via a Facebook promo. Villa Italian Kitchen will give you a free slice of pizza, with valid ID. Arby's will have a vegetarian menu for Feb. 29 only. Urban Outfitters is having a $29 and below sale. Travelocity will give discounts of up to 30% on hotels until Feb. 29. Save 29% when you book select hotels worldwide through the Expedia mobile app on Feb. 29. Leap into savings with a sale on hair products at Folica.com. Through 11:59 p.m. Pacific time on Feb. 29, use code LEAPYEAR16 to get 25% off Solia, Theorie, Nth Degree and AbsoluteHeat products or 30% off Sedu products. Pizza Hut is giving a free personal pizza to Leap Day babies on Monday. Get a dozen original glazed doughnuts from Krispy Kreme for $2.29 with the purchase of any dozen regularly priced doughnuts at participating locations. On Feb. 29, save 29% when you book select hotels worldwide through the Expedia mobile app.